You may be wondering, “What does building a glass block shower have in common with Egyptian pyramids?” That would be a logical question. Sometime when you take on a custom shower project with heavy materials (in this case a beefy solid surface shower base and custom prebuilt glass block shower wall sections), just like the building of the Egyptian pyramids, the construction feat can pit mankind (or womankind) in a mental battle with materials they want to use. 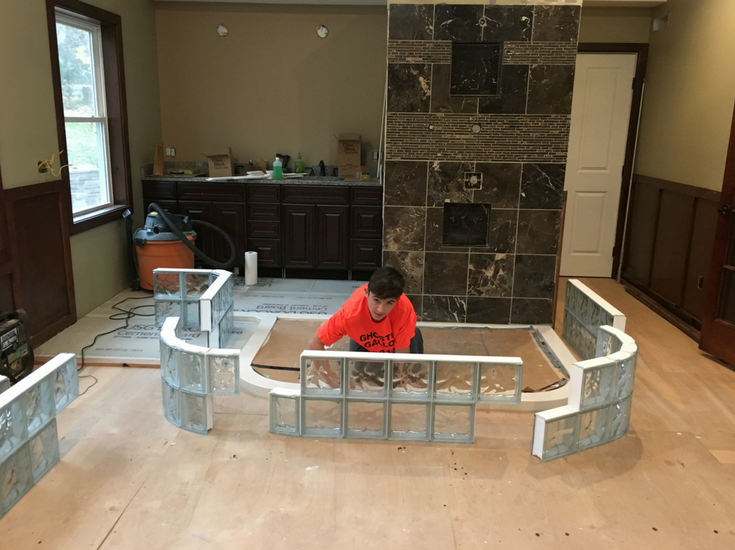 The weight of the materials was one of the challenges facing JR in a 2 year-long design and installation of a custom glass block shower. He invested time planning, measuring (remeasuring) designing securing products and then building a grand glass block shower unlike any others I’ve seen. It’s size, design and shape were not only unique – but the project was done without a full-time general contractor leading the way (now that’s a risky proposition). A project like this takes a special person (OK – John’s not your average guy). It takes a focus on design, planning and some special “engineering” along the way (some anticipated – and some solutions figured out “on the fly”). 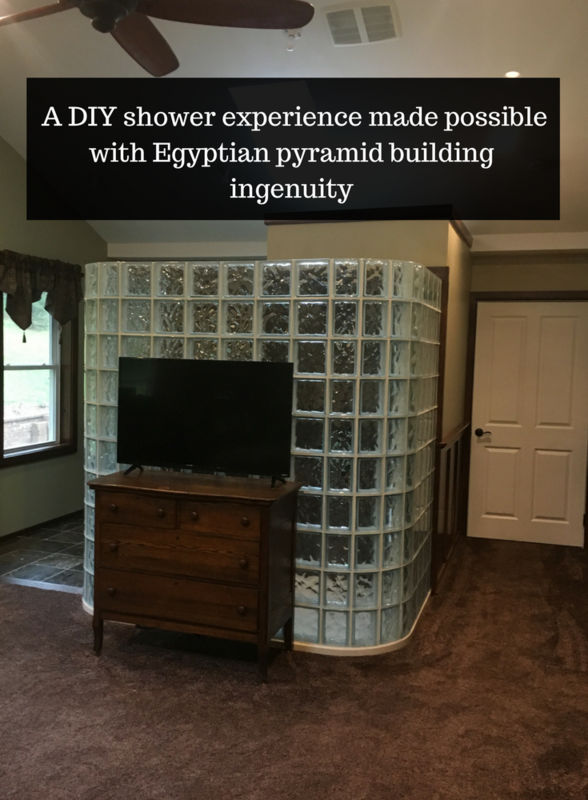 In the video below I’ll let John share with you his DIY custom glass block shower and solid surface base experience (and what it has to do with Egyptian pyramid building). Now that you’ve watched John’s video, I’ll share the 5 D’s to get you to the top with a unique glass block shower experience for your home (even if you’re project is not as grand as John’s). At the end John and I would love to get your opinions of his glass block shower. I want to hear your questions if you’re struggling with the steps to make this project a reality. How should the shower opening be designed? In John’s case, the goal was to make the opening a spacious 36” wide – but also to use a lower curb height for the solid surface shower pan so it’s easier to get in (and will reduce the chance of tripping upon entry). In this case a low profile shower pan was chosen. How can we make sure the shower “lives” well daily? 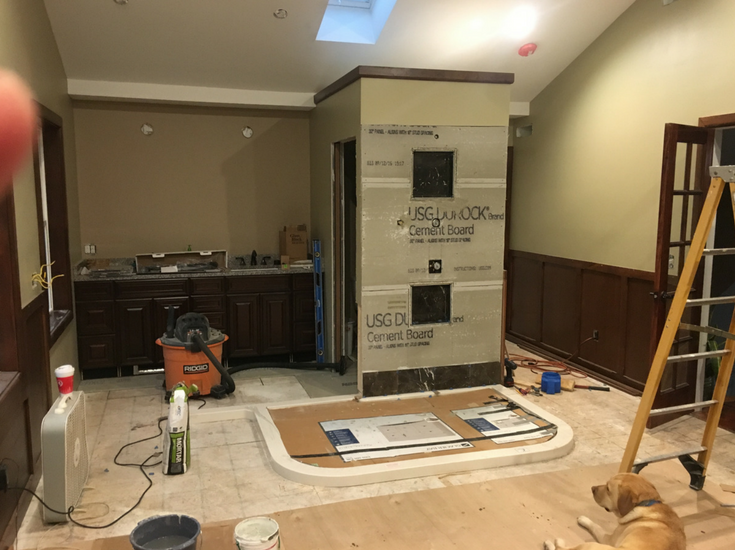 When you build a shower, you’ll want to think about where you’re going to put soap and shampoo containers (in this job John has 2 easy to reach recessed niches). In addition, can you design a place to sit down and relax? How can I have access to the plumbing if a part fails? If you install your plumbing on an outside wall you can’t fix a faulty valve except by taking down the materials on the inside plumbing wall. In this project John used a shared wall (with the toilet closet) so the plumbing can be accessed from a drywall wall if it were to go bad). Key takeaway – Don’t skimp on design time. If anything, be more thoughtful up front, it will save you time and money down the road. 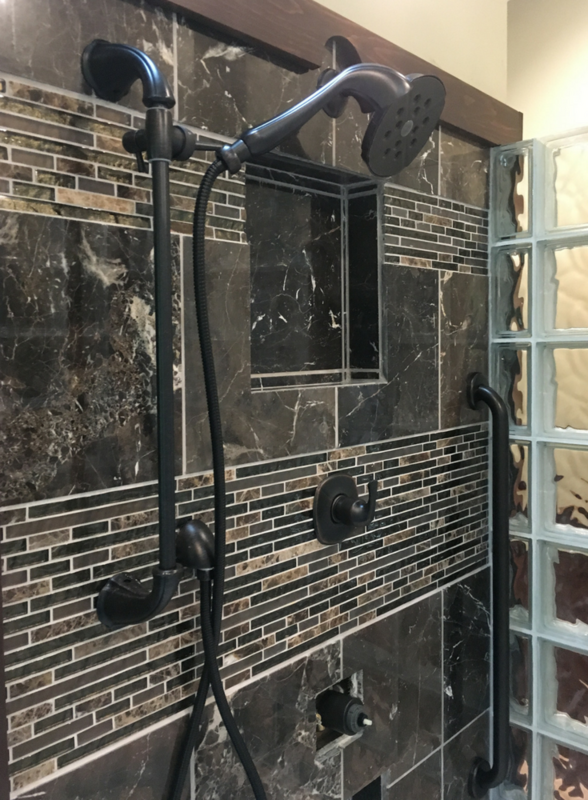 Key takeaway – The more details you think through the less of the “devil” will show up which challenges the completion of (and adds cost to) your DIY shower remodeling project! With that being said – sometimes the devil will still show up during the “discovery” process anyway (see D#3 below). You do your best to take time designing, nailing down the details and then despite your best efforts your still have an “oh crap” moment. The DIY devil rears its ugly head. You’re faced with an unexpected challenge. In the picture below you’ll see the challenge on the faces of the “lucky contestants” who volunteered to help John move his solid surface shower base. 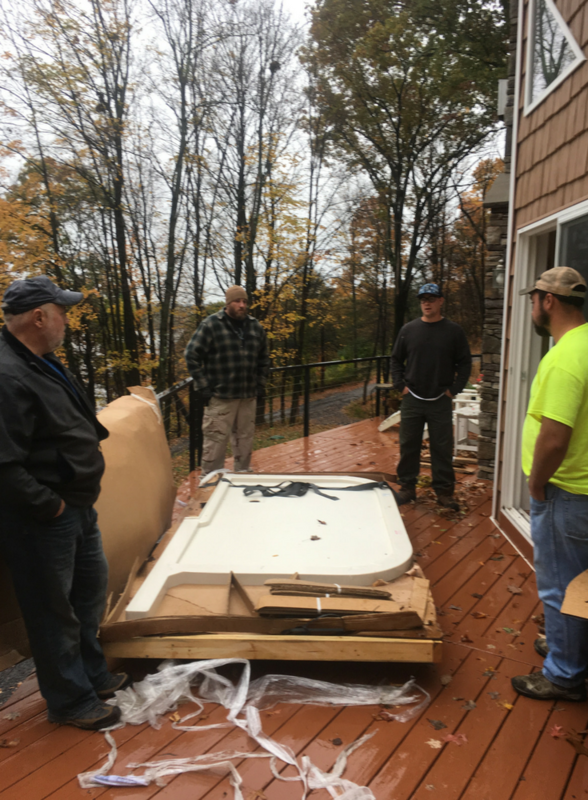 They had to get this shower pan from the outside deck, through the house and up to the 2nd floor master bedroom/ bathroom. This puppy weighs a lot of pounds! These guys don’t look overjoyed to move this shower base! As John mentioned in the video above he didn’t ask how much this base was going to weigh before it was shipped (and as the guy who supplied him this base, I should have got this information for him. Oops, that bad is on me!). The discovery process is when you must “use your noggin” and improvise as my Dad used to tell me. To move this shower base from the 1st floor to the second, John borrowed the ingenuity of Egyptian pyramid builders and made what he called his “Egyptian rig.” This wood contraption was similar in design to what pyramid builders used to move heavy stones up pyramids. They put the heavy shower base on the slanted wood platform (‘er Egyptian rig) and hoisted it up ever so slowly. In the end John’s home-made contraption got the job done! Success – the pan is up! 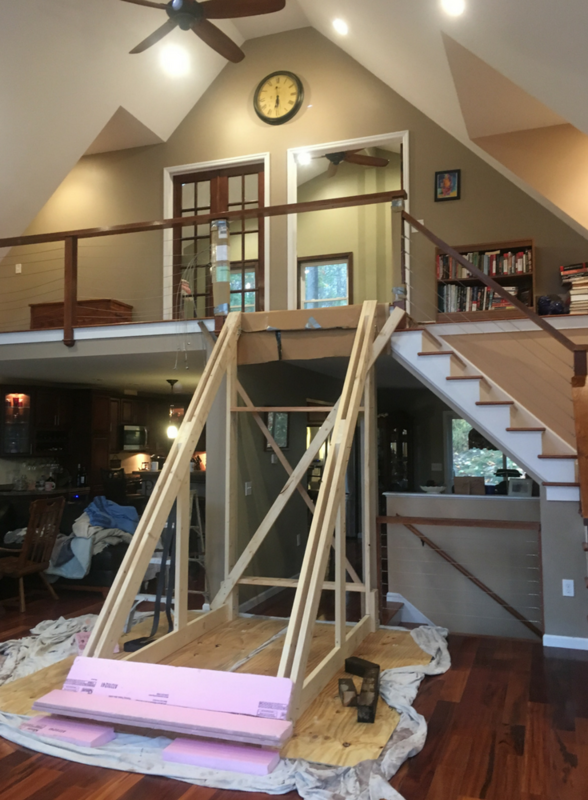 Key takeaway – I can remember my Dad telling me when I was a wet-behind-the-ears 23- year-old guy, “Mike – you will be tested.” In the discovery process (also known as the oh crap part of remodeling) you will be tested to use your ingenuity. If you can’t figure out a solution ask for help. The only thing you shouldn’t do is to not expect some of the unexpected. A wise man (or woman) knows what they don’t know. They know when they should get help to make it out the other side of a bathroom remodeling project. This help will need to come in multiple forms – the right people, simpler installation processes, and products which fit your design tastes. People – John roped (‘er got) multiple people involved to assist him through his project. This young guy here was even recruited into action! Processes – With the challenge of finding contractors at an all-time high and likely to get worse (read, Can’t find a contractor? Maybe it’s time to DIY your bathroom remodeling project!) you need to find easy to install systems to do a complex project. 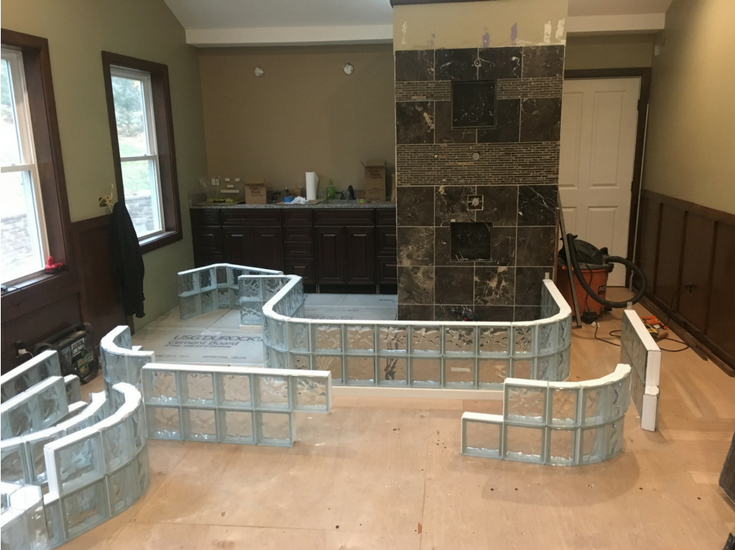 In this job, John used prefabricated glass block shower wall sections (and a custom shower base made to fit these sections) to have the ability to do this (normally) difficult curved glass block shower. Products – This job combined some old-world classic marble tiles with newly-styled glass blocks. Finding the right products to fit your design styles can take time – but persistence does pay off. 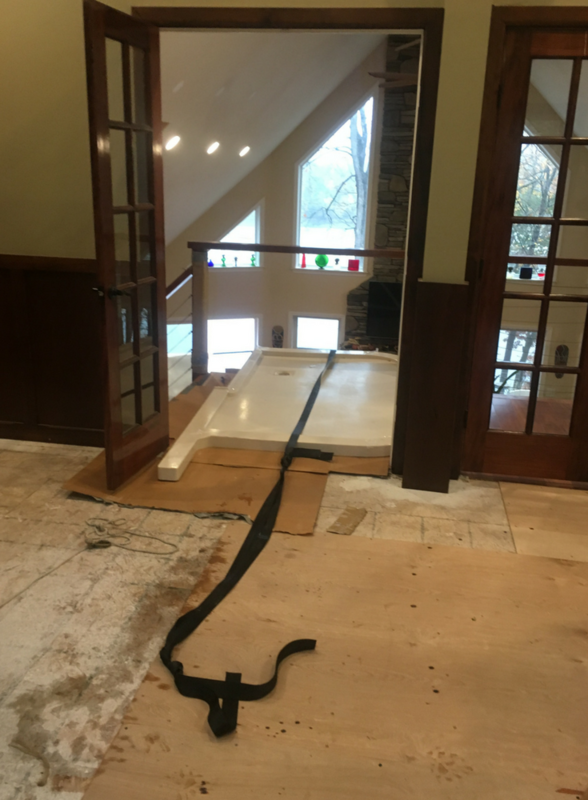 Key takeaway – In the DIY remodeling process don’t get a bad case of S.G.D. (note – S.G.D. stands for stubborn guy (or gal) disease). Seek out people to help along the way. Look for systems which save you cutting, assembly and installation time. The best projects are a team effort. Look for good teammates and premade products to make your life easier. Let other people share in the “enjoyment” of your project. No matter how you slice it, remodeling is hard work and requires a lot of mental and physical energy. What makes it fun is enjoying the shower at the end. As John said his glass block shower with a skylight above makes him and his wife feel as if they are showering outside. It is spacious. It has the creature comfort of a relaxing teak chair to sit down. It combines old world charm with new world convenience. It was worth the effort. Key takeaway – During your hard labor days keep your eyes focused on the prize –the delight you will experience at the end. Then you’ll enjoy the pride of a job well done, you can laugh about the challenges you (and your team) conquered (like a really heavy base and curved glass walls) and the satisfaction you made it happen. 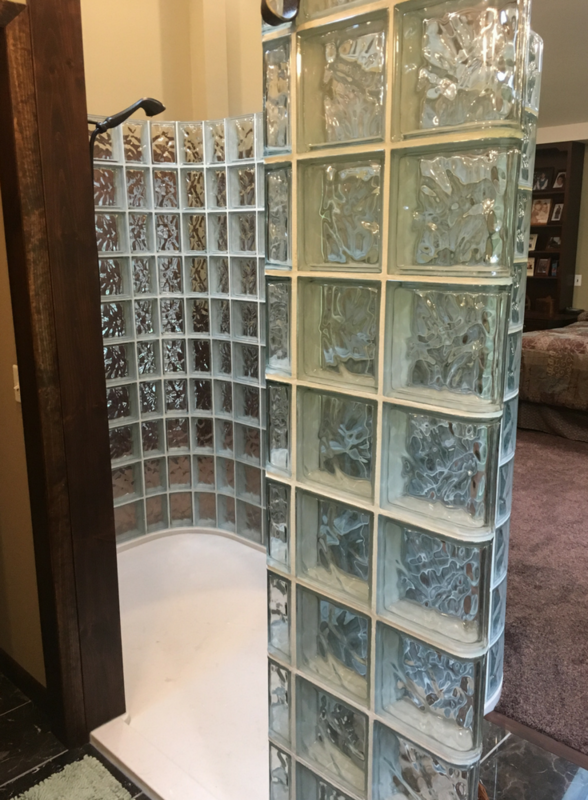 What do you think of John’s ultimate curved glass block shower? Do you see how the 5 D’s can help you make it out the other side of a shower remodeling project? Please let John and I know what you think of this project by commenting below (or giving me a call) with your questions on a project you’d like to do (no matter how big or small). For more information about a glass block shower system give us a call at Innovate Building Solutions at 877-668-5888. 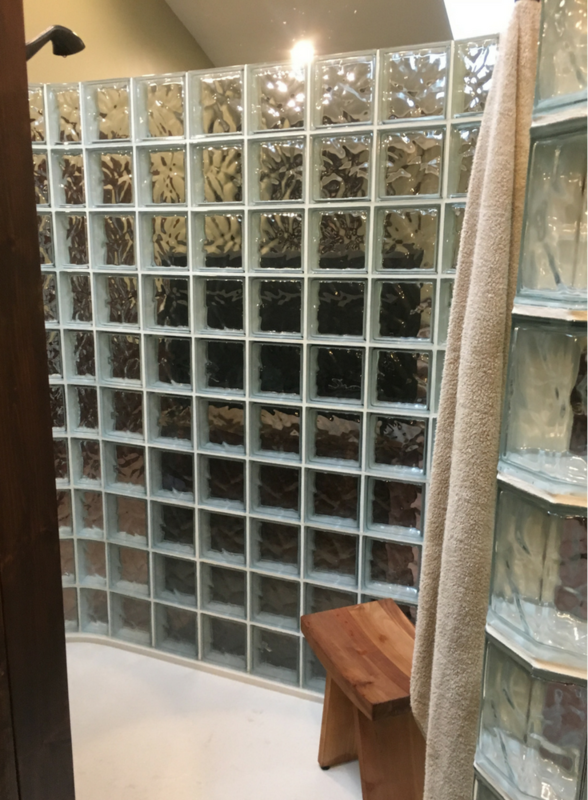 If you want a glass block shower designed and installed call Cleveland Glass Block at 216-531-6363 or Columbus Glass Block at 614-252-5888.